I love a good dog and rider story . Dog peeping over the edge at the end, thinking.. "f*ck that"
I wish my dog was smart enough to not get distracted half way down the trail. Can your a legend and a great person. 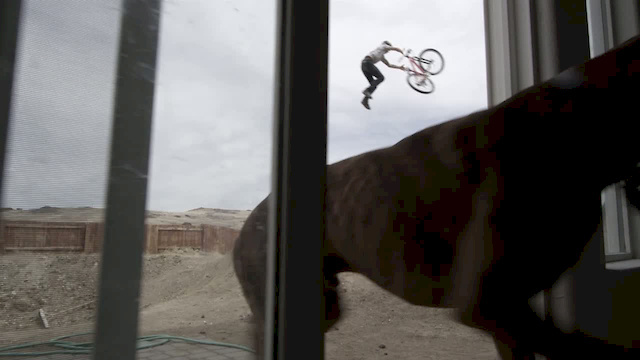 is the dog a rock shox boxxer? get it? This is pure passion! love the riding style and the way they ride together. in my opinion this should get VOD very soon! i love how at the end the dogs like i aint dropin that. great vid!!! I Like Movie. Very Nice!!! It would be awesome to be his neighbor. That dog is just amazing! last shot is just amazing. great vid. Dang...did he buy two houses? Must be nice to have two backyards for that run!! i want a dog like that!!!!!!!!!!!!!!!!!!!!!! his dog is a boss. The Bike Brothers jersey was a nice touch in this video! super nice gut and the dog is a leg! Does anyone know of a website that I can order that model of dog on? We're in Reno is this ?? The Hyper Is So Sick!!! R athertons vids a bit like this... its riders with pets week!